Fetal lower urinary tract obstruction (LUTO) can cause fetal morbidity and when severe, mortality also. 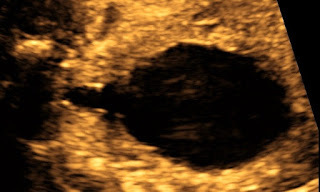 The typical ultrasonographic presentation of this condition is that of an enlarged bladder and obstructive uropathy bilaterally. Milder presentation of the disease results in less severe effects on the fetus. When the problem is actually severe, it can lead to oligohydramnios, dysplastic fetal kidneys with eventual pulmonary hypoplasia. This case is being presented to bring about awareness that timely antenatal diagnosis can improve the neonatal outcome. Fetal lower urinary tract obstruction (LUTO) is a condition in which there is obstruction in the lower urinary tract preventing flow of urine from bladder into the amniotic cavity leading to oligohydramnios. It can give rise to enlarged bladder with bilateral obstructive uropathy, and ultimately result in secondary pulmonary hypoplasia which can lead to fetal death. The occurrence of this condition has been reported to be around 22 per 100,000 births. 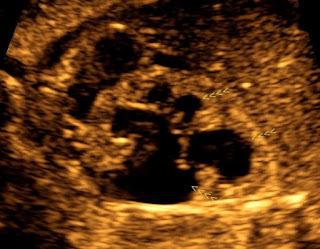 The condition is recognized when ultrasonography is performed during the late first or early second trimester of pregnancy. [2-5] A case of LUTO in the fetus diagnosed antenatally and managed successfully is presented here. A primigravida presented at pregnancy 29 weeks 5 days. Anomaly scan done at 19 weeks was normal. 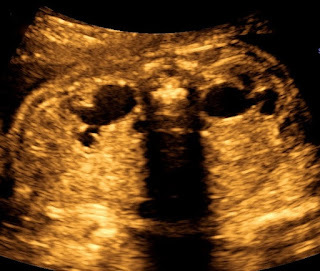 Growth scan done (by this author) at 29 weeks 5 days showed a fetus having bilateral hydronephrosis and hydroureter with ‘key hole bladder’ suggestive of LUTO with normal liquor. She and her husband were counseled and pediatric surgeon was consulted. At 30 weeks 5 days rescan was done, mainly to assess liquor and predictably the liquor amount had reduced. Amniotic fluid index (AFI) reduced to 7.2 cm, from 11 cm one week prior. Injectable steroids were given. The images confirming LUTO are shown below (figures 1,2,3). Figure 1. 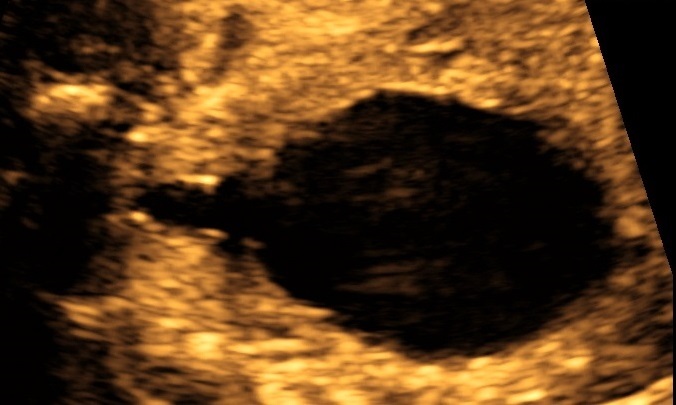 Hydronephrosis (longitudinal section). Figure 2. Hydronephrosis (axial section). At 31 weeks 5 days, she came with reduced fetal movements and a further reduction of AFI from 7.2 cm to 4.5 cm was noted. To summarize, in a span of 15 days, AFI reduced from 11 cm to 4.5 cm, which implied a significant reduction of the liquor volume. At 32 weeks, 1.5 kg male baby was delivered by lower segment cesarean section in view of worsening oligohydramnios. The neonate was attended to by a pediatric surgeon, who performed urethral catheterization with difficulty and the neonate was shifted to intensive care unit. Considering a very narrow urethra and chances of damage to the urethra in case of an attempt to fulgurate the urethral valve, a cystostomy was done on 6th day of life. Baby was discharged in good condition from NICU after 1 month care. Fulguration of posterior urethral value was done at 3 months of age. At that time, the weight of the infant was 3.6 kg, and growth of the baby was satisfactory post procedure also. Presence of posterior urethral valves, urethral atresia or stenosis can give rise to LUTO. Complete bladder outlet obstruction (severe LUTO) is associated with high perinatal mortality due to pulmonary hypoplasia and decreased fetal renal function. The main objective of prenatal diagnosis and management is to detect those anomalies which need early postnatal evaluation and management. This case was successfully managed by following up through ultrasonography for liquor amount, terminating pregnancy at the right time and salvaging the neonate who underwent corrective surgery on time. The fetus may have otherwise succumbed to oligohydramnios leading to hypoplastic lungs and intrauterine fetal demise. LUTO is one of the late evolving anomalies. In such cases, late 2nd trimester & 3rd trimester scan is of great importance for identification. Timely detection, planning of remaining pregnancy, deciding about mode and place of delivery, keeping necessary specialist present at the time of delivery were all factors that led to good overall outcome of the fetus. LUTO is a late appearing anomaly. So, apart from growth, late evolving anomalies in late 2nd and 3rd trimester scans should be looked for. Multidisciplinary management improves neonatal outcomes. Tonni G, Vito I, Ventura A, Grisolia G, De Felice C. Fetal lower urinary tract obstruction and its management. Arch Gynecol Obstet 2013; 287: 187–94. Wu S, Johnson MP. Fetal lower urinary tract obstruction. Clin Perinatol. 2009; 36(2): 377-90. Lissauer D, Morris RK, Kilby MD. Fetal lower urinary tract obstruction. Semin Fetal Neonatal Med 2007; 12: 464–70. Hindryckx A, De Catte L. Prenatal diagnosis of congenital renal and urinary tract malformations. Facts Views Vis Obgyn. 2011; 3(3):165-74.